Meticulous attention to detail goes into the manufacture of each LabCommerce AeroSphere sampling canister, producing the highest quality summa-type canister available for air sampling, TO-14 and TO-15 analysis and air archiving or standard preparation and storage. Studies show that the AeroSphere canister is the highest performing sampling canister available, and exceeds the capabilities of silica-lining with respect to TO-14 and TO-15 compounds. AeroSphere air sampling canisters are constructed from precision-formed 304L (low carbon) stainless steel hemispheres. The interior surfaces undergo a proprietary electropolishing process, creating a chromium-oxide rich passive layer. Once electropolished, the canisters interior wetted surfaces are thoroughly rinsed with hot deionized water, dried and packagedall in a class 100 clean room. You can see the superior quality of an AeroSphere canister. Computer-controlled lathe welding equipment enables the LabCommerce welding process to be highly repeatable and ensures fully penetrated welds. AeroSphere canisters are continuously purged during welding with a blanket of ultrapure argon. The resulting welds and surrounding surfaces are oxidation-free and free of entrapped contaminants. 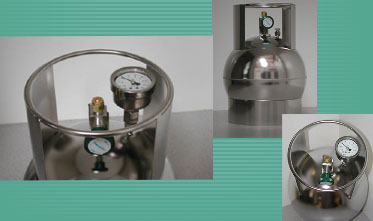 AeroSphere canisters are available with or without a pressure/vacuum gauge and can be built or modified to your specifications. For the most stable and conclusive sample analysis results, choose air sampling canisters manufactured by LabCommerce. You will notice the improvement in your data. Air samples remain stable over time. Superior surface morphology results in higher canister purity and significantly improved test data. 304L grade stainless steel, low in carbon for superior weld quality, and excellent resistance to corrosion. Ultra-high purity semiconductor standard and fully passivated canister interiors, leaving a chromium-oxide-rich layer free of adsorbed hydrocarbons. This proprietary process results in the most stable sampling canister available. Industry-standard spherical design and dimension; interchangeable with other brands. Welds are fully penetrated and oxidation-free. AeroSphere canisters come with a bellows seal valve, leak-tested to at least 4 x 10-9 std. atm. cc/sec. Helium. Alternative valves are available upon request. Contaminant-free canisters are thoroughly cleaned in hot deionized water and dried with ultrapure nitrogen. Each canister is purged with purified and humidified zero air while being baked out at over 250 degrees Fahrenheit to 300 degrees Fahrenheit. Canisters are leak-tested, evacuated to approximately 20 millitorr and shipped under vacuum, exceeding compendium method requirements and ensuring leak-tight performance. All LabCommerce canisters come standard with a capped second connection, for use as a gauge port. Gauges and other design modifications are readily available to meet customer specifications. Used at the most renowned governmental, academic and commercial analytical laboratories in the country and around the world. Satisfies the most demanding air sampling requirements. AeroSphere and other LabCommerce canisters (flasks) are used for convenient and reliable collection of ambient air samples. These high purity, passivated, stainless steel canisters are designed to maintain the integrity and stability of the sample while it is being transported to a laboratory, and while it is being analyzed. Common uses include the sampling of volatile organic compounds in air according to EPA Methods TO-14A and TO-15. AeroSphere canisters can also be used to prepare and store low-pressure, nonhazardous calibration mixtures. All LabCommerce canisters are purged and evacuated to approximately 2 millitorr with a vacuum pump. Sampling may be regulated with external components that control flow rate such as a critical orifice-containing flow controller. For time integrated sampling and for collecting pressurized air samples, LabCommerce manufactures the MCS series canister samplers. Available as either portable or rackmountable units, the systems include sampling pump timers and flow controls for self-contained precision air sampling. WARNING: AeroSphere canisters should only be used with pumping systems in which the pressure is controlled to no more than 40 psia. LabCommerce canisters (and air sampling canisters in general) are designed for pressures not exceeding 41 psia. Any pressure above 41 psia is considered a compressed gas per U.S. Code of Federal Regulations 49 CFR, Subpart D, 173.115(b) and must be stored in appropriately designed cylinders. This same regulation also prohibits LabCommerce canisters (and air sampling canisters in general) from being used with flammable, poisonous or liquefied gas. Last updated on July 10, 2018. LabCommerce™, Stabilizer™, Aerosphere™, Canister Blanket™, CycleClean™, CanisterPak™ and Meriter™ are trademarks of LabCommerce, Inc. Vespel and all other trademarks are the property of their respective companies. Last Updated on March 13, 2019.